Poi is a love letter to the 3D platformer genre of yesteryear. 3D platformers have seen a resurgence as of late in the form of Super Mario Odyssey and Yooka-Laylee, and the recent release of Poi aims to capitalise on that momentum. How the character controls is arguably the most important aspect of any 3D platformer. It can make or break the game, and luckily Poi’s protagonist controls quite well. The jumps are relatively fluid, however the character can feel stiff at times; the player can learn to get use to it, but it never feels as natural as some of the greats. Wall jumping is also well utilised and is always a welcome addition to any 3D platformer. Unfortunately, the game can stutter with the occasional frame rate drop which can make precision platforming frustrating. Also, world elemental hazards (fire, spikes, etc.) aren’t animated clearly, making it difficult to discern how to best avoid them. HD Rumble is a neat feature, however it isn’t utilized well as it seems to go off at inopportune moments. Hitting or getting hit by enemies feels weak and unresponsive, which is a missed opportunity for the HD Rumble feature. The enemies are original, but they reappear in every world. This makes the variety slim and it can get tedious defeating the same enemies over and over. Players can use the shovel to dig up hearts and coins, which is a bit game-breaking when low on health. Boss battles aren’t groundbreaking as they take place in 3D circular areas and the combat feels stale and lacking substance. Poi has a seemingly simple approach to its structure: collect medallions to unlock more worlds. However there is more depth than one would initially give it credit for. There are coins scattered around every world to which the player can use them to buy items or unlock challenges; however as the player exits and re-enters each world, the coins re-spawn, making them feel less special to collect. Each mission provides a fresh task that involves collecting objects, finding someone or defeating a boss. In every world, there’s a 100 coin trade for a medallion with a fox at a shop; this provides context for the task rather than just receiving it out of thin air. There are some innovative puzzles towards the end of the game, however some technical difficulties prevent them from reaching their full potential. The hubworld is referred to as The Sky and really adds a sense of openness and majesty. As the player continues to meet NPCs throughout the adventure, they’ll pop up around The Sky in their own airships providing challenges and new ways to collect medallions. To get to these NPCs, the player can jump off of the main airship and use a glider to fly over to the floating islands. Flying through the air feels like a breeze (no pun intended) and is easy to control. The challenges are expertly designed and they make the player feel accomplished upon completion. The player can also set new time records and even beat staff ghost times. There are also medallions to receive when the player collects every fossil, golden gear and location in each world, providing further incentive to fully explore all that Poi has to offer. 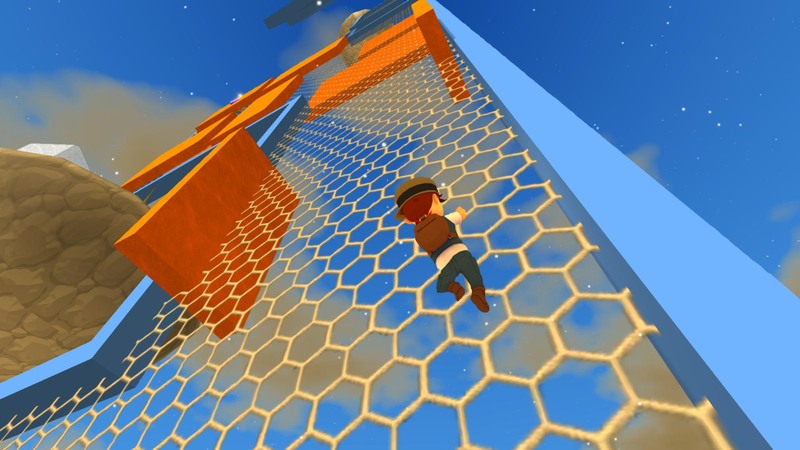 There is no fall damage in Poi, which appears to be the trend of modern 3D platformers. This makes it easier to traverse through the worlds, but offers less challenge to a genre that can be misconstrued as being too easy. Poi also doesn’t have a life system which has since become an outdated concept. There aren’t many water sections in the game, which can be considered as hindrances to platforming experiences. Players also cannot swim underwater, which can either be a positive or a negative depending on personal preference. Every time the player gets hit by an enemy, not only do they lose a heart piece, but they also lose a half dozen coins adding another level of challenge. This can be quite frustrating when there are camera issues or when the hit detection is off. Camera control is a crucial component of any 3D platformer which can make or break the experience. PolyKid clearly took this into consideration as the worlds consist of large open spaces, providing a lot of room for camera movement. However, there are some tight areas that make it difficult to adjust the camera to the optimal position. The draw distance is surprisingly impressive as the large worlds often have collectables far off in the distance. By all means, the draw distance isn’t perfect, but there is also a telescope tool that allows the player to zoom in on far off objects. Occasionally, the camera makes it difficult to determine where the player is going to land. It rarely happens and the player will grow accustomed to the camera and character movement, but it can become a hindrance at times. This was most noticeable when balancing on tightropes, especially in Cozy Cavern when there are three parallel tightropes on top of each other. However, there is a shadow underneath the protagonist which assists in knowing where they’ll land on regular platforms, but it’s difficult to see the shadow on the tightropes. In the occasional dialogue cuts, the camera can sometimes be set at an awkward position, and can just show a wall as dialogue comes up on the bottom of the screen. When gamers look back on 3D platformers and think about what was most memorable, many would say the worlds that they traversed. If a game doesn’t have memorable worlds that are a joy to explore, then what’s the point of even playing the game? The worlds in Poi offer fantastic platforming obstacles and ingenious level design, however the worlds themselves lack a certain flare to them. They are not very memorable as the main four worlds consist of cliché environments. Poi’s structure is reminiscent to that of Super Mario 64 and Super Mario Sunshine as the player is taken out of the world once they collect the mission’s medallion. This ultimately comes down to personal preference as to whether this is a positive or a negative design choice. What the worlds lack in wow-factor, they make up for in level design. Each world encourages exploration that makes the player stop and say: “oh, what’s that over there?” Collecting fossils, golden gears and uncovering new locations also add more incentive to search every nook and cranny of the worlds, leaving them packed full of things to do and discover. Each world is commendable for their sheer sizes as they are expansive and packed full of detail. The difficulty gradually increases as the game progresses (which is to be expected), yet there is also no sudden spike, making the game grow alongside the player. Each time the player enters a world, the environment could be different; sometimes it’d be raining, other times it could be at night. This feature helps to keep these worlds fresh and alive. However, it does appear to be a missed opportunity as the different changes do not affect gameplay. The first medallion in the fourth world does require the player to turn on the lights and search for the switches in the dark with nothing but a flashlight, but this experience was more irritating than clever. The separate challenges that the player can buy in The Sky offer ingenious platforming. However, the fact that they were not implemented within the main worlds make them feel inorganic. Scattered around every world are costumes and hats to collect. The hats come as a quirky surprise as they immediately equip when the player collects them. It’s also nice that the player doesn’t have to pull out their credit card for new gear *cough* EA *cough cough*, ahem… excuse me. Story is rarely a reason that gamers play 3D platformers. Whether it’s saving the Princess from some kind of turtle dragon or saving a small bear girl from a witch (wow, there really is an overkill on the damsel in distress motif, isn’t there? ), all gamers really care about is what happens in between. Poi’s story is a simple one, the protagonist wants to go on an adventure, so they do. Later on, it is discovered that the protagonist wants to collect the Milky Way Globe because… reasons. The substance of the story is not Poi’s strong suit, but it is the way that the adventure is told through meeting new characters and exploring new areas that brings the game alive. The plot of Poi is as complicated as it needs to be and nothing more. However, there are some tidbits of story development which come in the form of charming illustrations of the characters that tell of their ambitions to go on an adventure. Not having an overarching threat does leave out a sense of urgency, which can affect the player’s motivation to continue. The lack of threat also prevents context for situations that occur later in the game. However, once the player has collected all one hundred medallions, a heartwarming bit of dialogue makes the player look back on the adventure with fondness (no spoilers…). Character development is simple and can lack substance at times. However, there are witty moments in the dialogue that can put a smile on the player’s face. As the player encounters new characters in each world, they join The Sky. This makes it feel as though the player is making new friends along the way. The task is to then help each of them fulfill their dream, which appears to be a consistent theme throughout Poi. 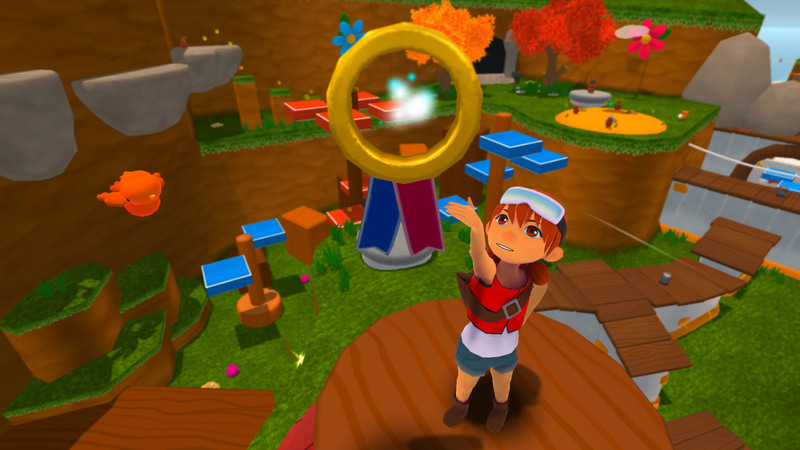 A theory is that the developers at PolyKid achieved their dream whilst making this game, so they wanted to incorporate that in Poi. Every 3D platformer requires stellar music as the player traverses through the worlds… because the player is going to be there for a while. Music from past games continue to stick in our heads, and just a few notes can instantly create warm feelings of nostalgia. Poi’s music is dynamic and catchy, oddly similar to Pixar music. The score brings positive vibes throughout the game that enhances the experience. However despite the music in The Sky, none of the pieces are particularly memorable. The music can also become very repetitive and players can soon find themselves wanting to go to a new world just for some new tunes. There is also no music in the pause menu, which is a minor complaint, but it does feel odd. At times, there was also be the odd occurence where the music didn’t cue in The Sky, breaking the immersion. The most popular of 3D platformers generally have a bright and colourful design, and Poi is no exception. The game has a charmingly clean look that resonates well with the worlds and their inhabitants. In terms of art direction, it’s clear that the developers wanted a straight cut colourful motif. This then allowed the player to clearly differentiate between the various platforms and its surroundings. When playing Poi, feelings of nostalgia can flood back to the golden days of 3D platformers. With a lack of textures and straightforward design elements, Poi is clearly reminiscent of the 64-Bit era. The enemies and characters have imaginative designs without trying to exaggerate the creativity. However, the character models can come across as stiff and unresponsive. This can greatly impact on their emotional value, leaving the player unable to relate or project themselves onto the protagonist and NPCs. Poi is a very respectable 3D platformer that is currently riding the genre’s resurgence. It offers very challenging platforming scenarios that can test even the most seasoned veterans. This game is very elegant in its simplicity and offers a colourful world to explore. However, Poi ultimately falls just beneath its potential with the odd frame rate dip, stiff character models and it needing another level of polish. It’s a step in the right direction, but ultimately won’t be remembered as one of the greats of its genre. For more future reviews and interesting articles, click here to visit our Facebook page.